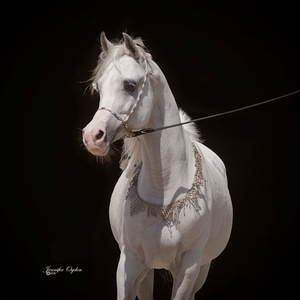 Athala Arabians is located in north Scottsdale, Arizona. It is easy to see why partners Athala King and Dr. Maureen McCormack chose to have a farm here. As you look across the desert landscape to picturesque McDowell Mountain and nearby Tonto National Forest, it is breathtaking. Besides the austere beauty of the desert floor with the majestic Saguaro cacti, it provides a never-ending and dramatic skyscape! The surrounding beauty is a backdrop for the beautiful Arabian horses that Athala and Maureen own and breed. From a practical business standpoint and good animal husbandry, it is also a prime location because of the industry support system and Arabian horse community. There are many, many training and breeding farms, Farriers, Feed and Tack stores, and equine Veterinarian practices with clinics readily available. Pair these with the global marketing due to nearby Phoenix International Airport, the Arabian Farm tours and the largest Arabian Horse Show in the USA, the annual Purebred Arabian and Half Arabian Scottsdale Horse Show, this area has it all. Athala, as a child grew up on farms and ranches with horses of many breeds and particularly loved riding. If a horse was under saddle, she was on it, or attempting to ride it! Quarter horses, Pintos, Thoroughbreds even a Shetland pony. Even today, she enjoys a trail ride. When she and Maureen moved to Las Vegas, Nevada ten years ago this is when they began their dream journey of becoming breeders of fine Arabian horses. Using the internet for research on Arabian horses, Athala found breeding farms and decided to contact breeders of Arabians. Logically she contacted Carolyn LaMarchina of Jocarta Arabians, (a cellist for Wayne Newton’s orchestra) and a breeder of straight Egyptian Arabians, thinking that she lived in Las Vegas. Carolyn’s farm however is located in Missouri so she promptly sent Athala and Maureen to breeders Ed and Merrie Aiken, owners of Cedar Ridge Arabians located in Las Vegas. Through this contact and a weeklong course on Arabian horses in Taos, New Mexico at the school of Arts there, the business developed. It was also at this course where Athala met future mentors Bridgette Orwig and myself, Christie Metz. 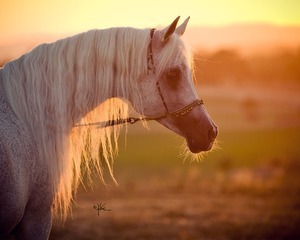 In 2005 Athala Arabians became a reality starting with the purchase of two straight Egyptian Arabian mares from their first mentors, Ed and Merrie Aiken. Named Cedars Jazzy Gemma (Gatsby CC x Cdrs Farah Moniet by Imperial Imsirdar) and Samedi (Al Baraki x Shalom Sabbath by Ibn Amoura), these two mares carved a very special place in Athala and Maureen’s hearts. A passionate avocation quickly grew into a vocation. Since those first purchases, they have very thoughtfully added to their brood mare band and now with foals have eleven horses. Kuy Shaihyna (AK Shaikh x DB Naseema by Nabiel) Jada SMF (Majestic Noble SMF x Ansata Haalah by Ansata Iemhotep), Shearee (Asfour x Simeon Shearith by Anaza Bay Shah). 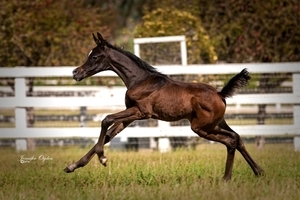 Using a prefix of “A” before the foals name there is now A Illuminatus (Ansata Nile Emir x Kuy Shaihyna), A Samia (Simeon Sadran x Samedi), A Assad (Marajj x Cannette) and A Canen (Besson Carol x Cannette). Cane, as they call this beautiful young stallion is working his way to the National show ring with Chris Culbreath training and riding him in Western Pleasure. A recent addition is a mare named ESA Aminaah bred by Dr. Jay Chollack and Polly Schaefer of Eastern Star Arabians. This exciting2008 bay mare will make her debut for Athala Arabians in The Las Vegas World Cup in April with Ricardo Rivera handling. Neither woman is a stranger to business or hard work; Athala with a Master’s degree in Social work and a musical background had a successful business providing custom music for such organizations as the Ronald McDonald House of Denver, The One Day Foundation of Denver and Discovery Zones. This gave her a good sense of blending the artistic with business, and of course, she has that “artistic eye” as well. Maureen with her experience as a successful Radiologist provided a nice balance of communication skills along with medical skills that easily transfers to equine reproduction and health.